PRINCE2, PRojects IN Controlled Environments (version 2) is a generic project management methodology that describes the key elements for controlling a project, regardless of project type or size. 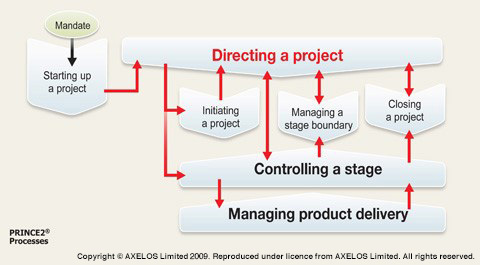 Today, thousands of organisations have adopted PRINCE2 or a tailored version as their standard for project management. The PRINCE2 as a best practice framework, its Methodology comprises of 4 project management elements referred to as Principles, Themes, Processes and Project Environment. The PRINCE2 processes and management themes are designed to ensure these principles are applied throughout the life of a project. There are seven management themes described by PRINCE2, which is seen as relevant for all projects. The management themes outline project management activities, documents, roles and responsibilities that support the application of the principles mentioned above. At the centre of the PRINCE2 model is a series of project management processes that detail the activities and responsibilities that relate to the application of the principles mentioned above and themes. These methods provide an order in which the principles and themes should be applied during each phase of a project. In summary, many project management standards are designed to explain ‘what’ project management is, but often do not provide a comprehensive approach illustrating how to apply project management. PRINCE2 focuses on how and when important elements of project management should be applied and who is responsible for these elements. This is why PRINCE2 describes itself as a project management methodology and a core reason why today thousands of organisations have adopted PRINCE2 and over 1 million people worldwide hold a PRINCE2 qualification. Learn more about PRINCE2 project management courses by attending one of our public training programs. View our next training dates.